You'll find that a lot of IT providers can talk the talk, but will they walk the walk? If you partner with the right managed service company, you'll have peace of mind knowing your IT is handled effectively and holistically. But how can you make the right decision from the get-go? 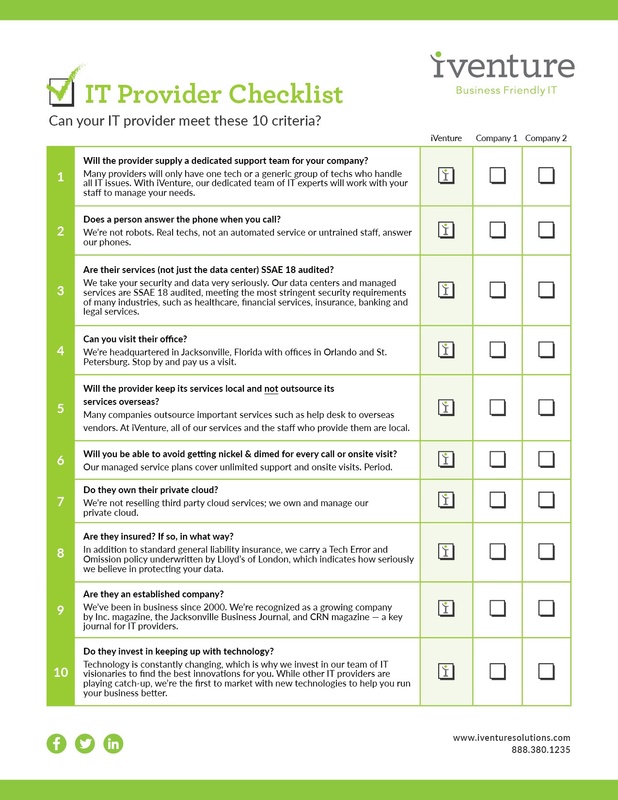 This checklist will guide you in what questions to ask and what criteria are a must for your business. Take this checklist with you! Make the right decision for your business. iVenture Solutions is an award-winning managed service provider delivering superior IT solutions to clients across Florida. As a leading-edge IT firm for small and medium-sized businesses, we provide a diverse range of services covering the entire scope of IT including maintenance, support, hosting and more. Through rapid response time, reduction of chaos and the right people, our expert team of IT professionals will fulfill your technology needs. At iVenture, we give you more time to do what matters most.